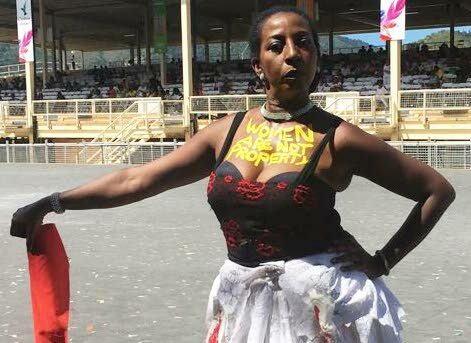 Performance artist Leah Gordon is “reclaiming her jametteness” with a bold costume designed to bring attention to the plight of abused women in TT. The word “jamette” comes from the French word “diametre” and referred originally to someone on the fringes of society. Gordon’s costume was designed to catch the eye – she had the words “Women Are Not Property” painted in bright yellow on her dress, and wore a white skirt dotted with sanitary napkins stained red in faux blood. “This is a hybrid costume with elements of the jamette mas and the pisse en lit (bed wetter)– the most objectional forms of mas in the early days of Carnival,” she said. The sanitary napkins are a reapproiation of the pisse en lit mas, she said. She also carried a red flag, reminiscent of the flag woman. “I want to send a message. Women are not property. I want men to get the message that they do not own us, because when women try to leave a relationship, that is when her life is most in danger,” Gordon said. Her portrayal, she said, is for the women who have been killed by abusive partners, the ones who are currently suffering, unable to escape, and those in the future so they will not have to endure such an experience. Gordon described herself as not part of any band, but just roaming. That freedom of movement is how she is reclaiming her jametteness, she said, as a proud 21st century jamette. Reply to "Artist reclaims her Jamettry"